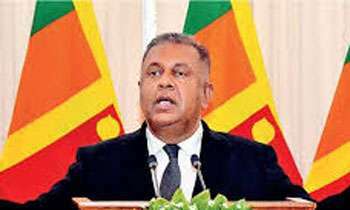 The government will invest some Rs.80 billion in developing rural roads, rural markets, and other public facilities, Finance Minister Mangala Samaraweera said. He said the Gampereliya scheme will be the primary focus of the government’s economic agenda over the next 24 months. The first Gamperaliya exhibition will be organised in Monaragala on August 16 followed by Anuradhapura and Jaffna. At a function held on Wednesday he said in the Budget speech last November, he presented “Enterprise Sri Lanka” scheme based on the government’s 2025 vision document, to create a new entrepreneur class, recalling our history as a trading and a commercial hub in the ancient times. The Minister said for the Past decade our economic growth was dominated by the domestic sector and exports reduced to 12% of GDP in 2014 while FDI stagnated. “Therefore, this economic model resulted in the creation of growing external liabilities whilst external assets and inflows were dwindling. Government revenue was falling for decades to reach one of the lowest in the world. Debt servicing exceeded the total government revenue. The effects of previous borrowing will be felt more severely in the time to come. More than 75% of government debt servicing during 2019-2022 will be due to maturing or bunching of debt obtained prior to 2015,” he said. Minister Samaraweera said the 'Enterprise Sri Lanka loan schemes’ will be ceremonially launched by the President and the Prime Minister at the BMICH on June 22. “These schemes will target the most productive investment sectors. It is private enterprise that is created and expanded through these programmes which will drive Sri Lanka’s future growth. In addition to the revival of private investment driven by Enterprise Sri Lanka, it is necessary for the state to invest directly in the rural economy. Towards this end, the government will also be introducing the rapid rural infrastructure investment scheme, GAMPERALIYA. This includes the rehabilitation of over 22,000 rural tanks which will have a major impact on agricultural productivity and agricultural incomes that have suffered during the previous droughts,” he said. Where is the duplication road extension we have been waiting for, for the last 30 years? Enterprise Sri Lanka appears to be an eye polish. How much inquiries made via the internet, they are unable to give a mailing address or an email address enabling the deserving public to make any approach.I am fed up.